The U.K. and the EU might "create an option to extend the [Brexit] implementation period for a matter of months," U.K. Prime Minister Theresa May said Thursday, after talks with European Union leaders stalled in Brussels. The Brexit timetable currently calls for a 21-month transition to begin next March. But that could be in jeopardy, as negotiators have been unable to get past sticking points in laying out the terms of the U.K.'s departure from the EU. After May spoke, European Council President Donald Tusk said European leaders would likely agree if the prime minister asks to extend the transition period. 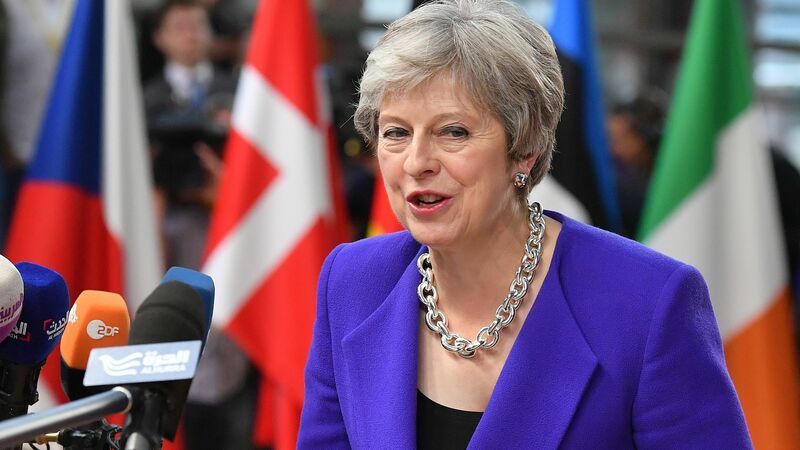 May mentioned the possibility of prolonging the transition immediately after saying the leaders had made "real progress" — something she has said repeatedly in recent days. "I believe a deal is achievable and now is the time to make it happen," the prime minister told journalists at the EU Council meeting on Wednesday. But that was before May spoke to her European peers. By the end of the day, a November summit that had been planned to move into the next phase of discussions had been called off, due to a lack of progress. The biggest snag: how to form a customs border between Ireland — an EU member — and the U.K.'s Northern Ireland, without establishing a hard border between the two. With little progress in negotiations and worst-case scenarios seeming more likely, NPR's Soraya Sarhaddi Nelson reports, "European leaders say they are working on contingency plans for a U.K. departure from the bloc without a deal on how to manage critical issues like borders, customs and air traffic control." More than two years after U.K. voters chose to leave the European Union, a string of big deadlines are looming. Now that November's meeting has been canceled, the next EU summit would come in December — a session that was timed to give all the legislatures involved enough time to ratify a deal. Another big date arrives on Jan. 21, 2019, when May faces a final deadline to send a Brexit deal to Parliament. All of those mileposts are on the drive toward March 29, when Britain will officially exit the EU, triggering the transition period set to last through 2020. As she tries to hit those marks, May faces the daunting task of not only negotiating with the EU's 27 other countries, but also selling the terms of any deal to hard-line Brexiteers at home. "She's between a rock and a hard place," former Finland Prime Minister Alexander Stubb said in an interview with NPR's Morning Edition. "I don't envy here in any which way." Stubb, who is vying to be the next European Commission president, predicts there will "definitely" be a Brexit deal in place by March. But he notes that the options are dwindling. "I think 'soft Brexit' seems to be unfortunately out of the question," Stubb said of the possibility that the U.K.might maintain close economic ties to the EU. "Hard Brexit means that there are going to be some tough choices to be taken — I think that's what they're working on right now." As for the chance that the U.K. might leave the union without a deal at all, Stubb said a no-deal Brexit "would be a catastrophe." May has tried to maintain an optimistic tone when speaking about the U.K.'s pending exit, touting progress in the complicated talks even as she acknowledges the stark divide between the two sides' positions. But speaking to the House of Commons earlier this week, May called the remaining disagreements "frustrating," particularly because they revolve around hypothetical circumstances. In his response to that speech, opposition leader Jeremy Corbyn of the Labour Party said, "This really is beginning to feel like Groundhog Day."